Recently this Allergic Traveler had the opportunity to play tourist locally. An old friend came to town and I wanted to show her some of the unique characteristics North Carolina has to offer. About 20 minutes from here, in Jamestown, NC lives the largest dresser in the world. Yes you read correctly! The said dresser is attached to the largest furniture store in the world, Furniture Land South, with more than 1.4 million square feet. We had a great time visiting and seeing all kinds of unusual pieces from all over the world. There were diamond-encrusted sofas, poker tables, acrylic side chairs, corkscrew dining room sets and so much more. It was really quite an adventure. I would have to say that my favorite was the massage chairs. It was a great way to relax amid a 4 hour shopping excursion. After seeing the world’s largest dresser, I started to wonder what other oversized items are out there? Is there really a fascination with bigger is better? Are these gigantic items attracting tourists everywhere? 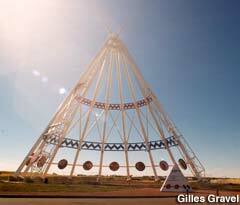 As a child I visited, the world’s largest Teepee, which is located in Medicine Hat, Alberta. 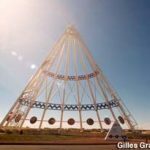 It measures 215 feet tall and is 160 feet wide at the base. You can learn more info here. So what else is out there? 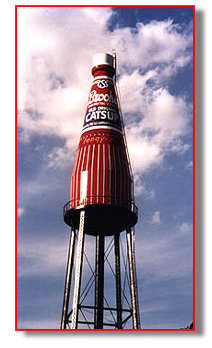 Well there is the world’s largest ketchup bottle, which incidentally is for sale in case you have an extra $500,000 lying around. There is also a fan club that you can become a member of in case you miss the bottle once you are finished visiting it. 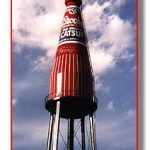 The bottle is located in Il. To get more info, click here. 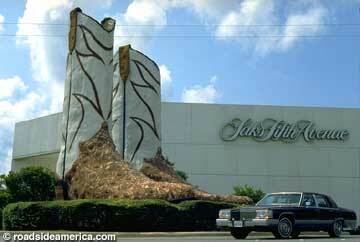 The world’s largest cowboy boots are located in San Antonio, Texas. It’s not really a surprise that these are located in Texas. I recently had the pleasure of seeing these up close. They are located outside of the North Star Mall. They have actually traveled a bit on their own. Learn their story here. And I admit it I came home with cowboy boots! How could I not? There is also the world’s largest tire in the heart of what used to be America’s automotive industry, Michigan. The Uniroyal Tire is more than 80 feet high and has been featured in various music videos over the years. So would you plan your trip to see the world’s largest? These types of trips are practical if you live close by or if you prefer to drive instead of fly. They also make sense for those of us with food allergies, as you can pack the car full of safe food. The great thing about traveling is that you are guaranteed to see something new, whether big or small. So what would be on your World’s largest bucket list? 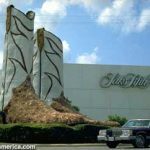 I think I need to find the world’s largest shoes! I would love to hear what you have seen or would like to see. Let us know what we are missing!